When it comes to feasts, German culture’s all about four words: “the more, the merrier.” Slide into a biergarten table, cheers your glasses, and make instant buddies with the strangers sitting next to -- and across from -- you. 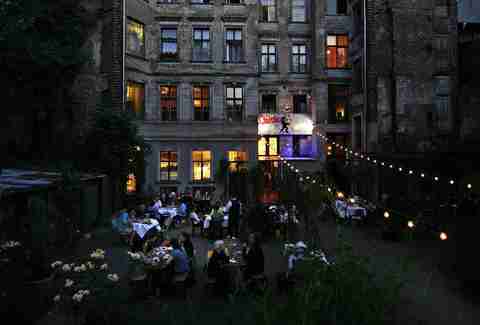 As such, Berlin’s got plenty of venues and restaurants where wining & dining with a big posse is not only accepted, it’s encouraged. Here are the best of the best, and a little insider tip to boot: you’re going to need a reservation. Berlin’s oldest beer garden is an idyllic spot for corralling good company together, with wooden tables parked underneath chestnut trees and huge umbrellas. Find a beer bank, squish everyone in, and spend all day and night gorging on a traditional German menu. Prater serves its own signature pilsner, schnitzel, goulash, and one mean apple strudel. How to reserve: Online for groups of up to four, or by phone +49 (0)30.448.5688 in the restaurant. Beer garden reservations aren’t allowed, so arrive early to save a spot. 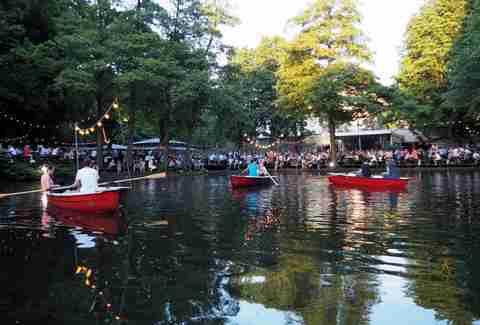 Café am Neuen See is a little slice of paradise off a large pond in Tiergarten, Berlin’s largest park. Think plentiful outdoor benches for cozying up, and German countryside vibes (herding your group onto the regional train is so unnecessary!). Sit down for all-day beer, pretzels, pizza, and flammkuchen (a German delicacy that’s like pizza, only better, as it’s slathered with creme fraiche, bacon, and onions). How to reserve: Email info@cafeamneuensee.de or call +49 (0)30.254.4930. 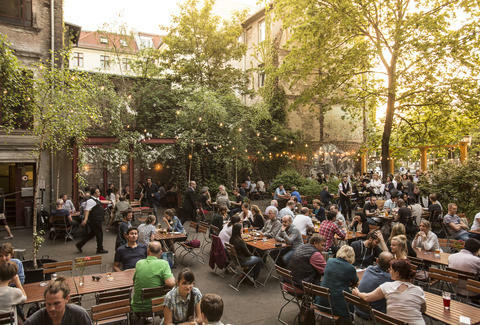 Besides being a pioneer in the local craft-brewing scene, Brauerei Eschenbräu also happens to have one of the best outdoor beer gardens in Berlin. It’s hidden away inside a residential courtyard in Wedding, and when you come, you can order from a smorgasbord of seasonal beer, flammkuchen (seriously, you need try this), and pretzels. As is traditional in beer gardens, you’re also allowed to bring your own picnic baskets packed with goodies -- plates and cutlery are even available on pre-order. How to reserve: Email info@eschenbraeu.de or call +49 016 249 31915. Earn serious props for picking Clärchens, a century-old ballroom in Berlin, for your next crew rendezvous. It’s a massive venue with a lot of options for group members to splinter off and do as they please. Start with a dinner reservation in the outdoor garden or the jaw-dropping mirrored ballroom, and let the evening cascade into tango dancing and/or jumping around to German pop music and live bands. How to reserve: reservierungen@ballhaus.de or call +49 (0)30 2829295 only between 9am and 4 pm, Monday through Friday. 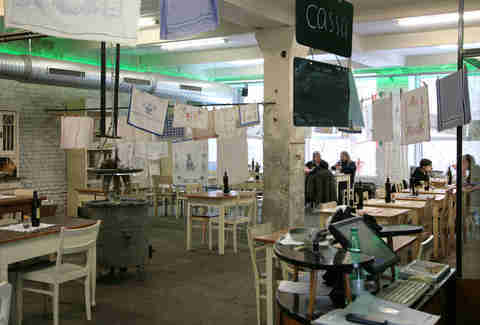 3 Schwestern is located in the eclectic-yet-old-world Kunstquartier Bethanien, formerly a hospital, and now an arts centre. The restaurant is bright and roomy, leaving lots of space to push a few tables together, with a lovely outdoor garden as another option for large parties. Just like Kunstquartier, 3 Schwestern’s menu is also diverse, so there’s something for everyone, from pasta, steak, and wild game at dinner, to German cold cut platters, and even huevos rancheros for breakfast. How to reserve: Email info@3schwestern-berlin.de or call +49 (0)30 600318600. 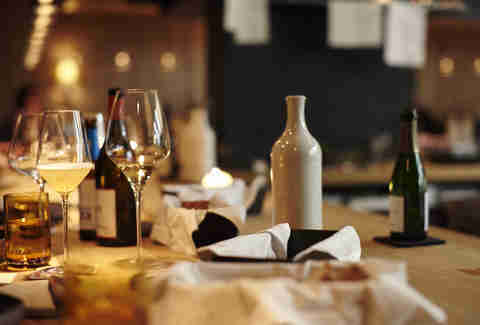 One of the most longstanding and beloved Italian restaurants in Berlin, Lavanderia Vecchia is perfect for a gang dinner thanks to its four-course set menu at €58 per person, which includes dessert, an espresso, and half a bottle of wine (though you’ll probably end up ordering more). Located inside what was once a big old laundromat, Lavanderia has many tables, but you’d be wise to make a reservation as far out as possible. How to reserve: Email info@lavanderiavecchia.de or call +49 (0)30 62722152. Walk into Berlin’s oldest restaurant, Zur Letzten Instanz, almost any night of the week and you’ll find it packed to its antique wooden rafters with groups of German and international tourists (as well as students on field trips). Be prepared for chaos, and undoubtedly the city’s best traditional Berlin dishes, like Prussian meatballs and a bright-pink pork knuckle that’s prime Instagram material. This Michelin-starred restaurant -- which exploded on the scene around a year ago -- offers a real-deal communal dining experience. Nobelhart is cozy, with space enough for just 28 guests per night (14 of which get seated around one massive table). Everyone’s served the same 10-course menu in one sitting – and along with a serious wine, beer, and schnapps list, it makes for the perfect atmosphere of buzzy, heady discussion. How to reserve: Email dubist@nobelhartundschmutzig.com or call +49 (0)30 259 40610. The restaurant will also call the same day or day before your reservation to re-confirm, otherwise you could risk losing your table. Barbara Woolsey is a writer who’s dreaming of Oktoberfest just writing this. Follow her on Facebook and Twitter.